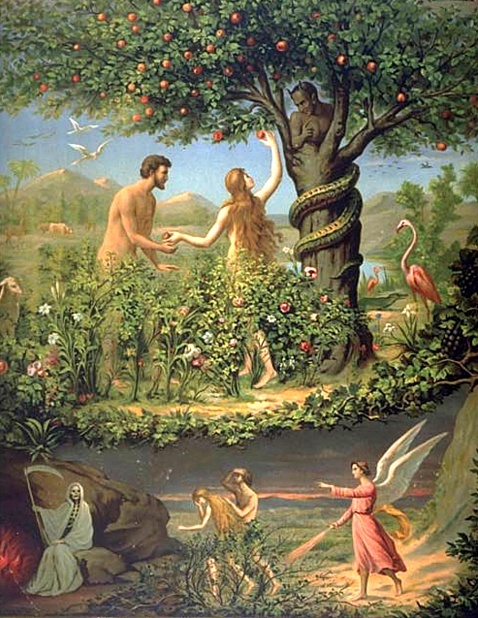 As bizarre as it seems, there are now a group of false teachers that have arisen within the ranks of the Preterist movement who astonishingly claim that the death that God threatened Adam and Eve with on the day that they would partake of the forbidden fruit in the Garden of Eden was not physical death, but was ONLY spiritual death. Adam was threatened with death ‘IN THE DAY’ that you eat from the forbidden tree. Both Adam and Eve disobeyed that command but both did not die immediately, or on the same day. Therefore, it could not have been physical death with which God threatened them. Instead God was threatening them with spiritual death. While this is easily refuted, unfortunately those propagating this foolishness have managed to confuse some of the saints of God with their sophistry. As a consequence, we need to spend some time dealing with this nonsense so as to provide some much needed comfort and correction for those who have been taken in by these modern peddlers of error. The threat of death is first seen in Genesis 2 where we quoted above. AFTER Adam and Eve had disobeyed the clear command of God, the punishment threat was repeated with much further elaboration than was initially included in that 2nd chapter. I am going to quote at length from Genesis 3 picking up where the Most High systematically went to each of all three beings involved in this consequential sin. “BECAUSE”. When you read this, think CAUSE and EFFECT. Because you did this, said the Lord to the devil, therefore this will be the effect, or this will follow as a consequence. AS A RESULT of that sin. Also, as a CAUSE, this same sin of Adam and Eve, brought forth the VERY FIRST PROPHECY of the Gospel. This is the protoevangelium, the gospel in its earliest form. This SEED of the WOMAN clearly foretold a MAN who would come to undo the work of the devil (CRUSH his head) and in the process of so doing, would have his heel bruised by this same serpent. That of course is what happened at the Cross but that is not the focal point of this particular work. Rather it is to show the connection between the sin of Adam and the curse entering into the world. Moving on to the woman, Eve; we see the same sort of CAUSE and EFFECT. While the word, ‘Because’ is not explicitly used, it is easy to see that God told Eve because of her sin, she would now suffer pain during childbirth and would be in a position of subjection to the man. It is interesting to note here that now we see the GROUND CURSED on account of Adam. The animals are listed in the curse when God rebukes the devil. Here we see the soil itself will now become cursed. I should also note that returning to the now-cursed ground (dying physically), shows that the curse descended upon Adam as well. This is in all in connection with the “because you have listened to the voice of your wife”. I marvel at the fact that there are actually some out there among the professing saints of God who unashamedly will declare to us less enlightened ones, that physical death was a normal part of being human PRIOR to the fall of Adam. They claim that Adam was destined to die regardless of his sin merely because he was human and was not immortal and that physical death was not part of the curse, only spiritual death. Paul, who acquired his understanding directly from the risen Christ, tells us in no uncertain terms that death was not in this world until sin entered, physical, spiritual or any other kind of death. As a matter of biblical truth, God, after He created all things in six days, man being made on the sixth, rested and declared all that He had made VERY GOOD (Gen 2:31). Tell me, if Adam was destined to die physically anyway, because he was human, why would God declare His creation GOOD, if it included death in it? So what we have now is the bizarre notion that God declared death as VERY GOOD seeing that it was necessarily part of the human condition according to these peddlers of novelty. According to them, God declared that death, something that He Himself calls “an enemy”, was not just good but VERY GOOD. Try wrapping your mind around this perverse declaration! Strange that something He would eventually conquer and abolish in Christ is declared to be a good part of His original creation is it not? Paul also tells us in the next chapter of that same letter, that sin merits death. Think through this carefully… what is a wage? A wage is something that is OWED to an individual. It is not a gift. If I make an agreement to provide my services to an employer for $20/hour, at the end of that pay period when he comes to settle accounts with me, he OWES me $20/hour. I do not thank him for the gift of my salary, do I? Certainly not! I have entered into a sort of contract with him which says that I agree to exchange my particular set of skills/talents for money. My skills help his business thrive and prosper and in exchange for that, he returns me a portion of the profits in the form of money. My employer has contracted a debt that is owed to me. How do you think an employee would react after being informed that his employer has decided not to pay him for his week’s worth of work? Thus the WAGES of SIN become a matter of JUSTICE. God Himself declared the JUST punishment for sin and that punishment is DEATH. God did not OWE man this punishment until man sinned. Once he sinned, then the payment of this debt becomes a matter of justice. How do we know this? Because the apostle Paul told us it is a debt! That’s how! If I were to forcibly withhold food and water from my child, I could be arrested and charged with either manslaughter or a certain degree of murder. While I may not not directly take their life, I withhold the conditions/requirements necessary to sustain that life and therefore would be found by any jury as guilty of a form of murder (death). Since God expelled Adam and Eve out of the Garden, wherein was located the Tree of Life – the sustenance that they would require in order to continue in a state of life – He effectively sentenced them to physical death in so doing. That was the WAGE of SIN being paid directly by the man and the woman. That was the Divine judgment being meted out. There is simply no other REASONABLE manner of understanding this. Being banished from the Garden was a consequence of this sin, of this there can be no dispute. How then could anyone with an honest mind tell us that physical death is the natural condition of being human? It might be “natural” now since the fall, but it certainly was not “natural” prior to their banishment from the Garden and their exclusion from the Tree of Life. What was natural for the man back then during his innocence, was to abide in a state of obedience to the commands of God and have continued access to the Tree of Life. Death did not exist and could not have existed prior to his sin or else we are left with the logical conclusion that DEATH ENTERED PRIOR TO SIN which is a complete and utter contradiction of the doctrine laid down by the apostle Paul. Both Adam and Eve immediately fell into a different state of relation towards God after their sin – now they were sinners and separated from the life of God (Eph 4:18) – that is spiritual death in the sense that the apostle Paul uses the word in Eph 2 ( …and you were dead in your transgressions and sins… verse 1) However, God then furthermore DROVE OUT both of them from the Garden depriving them from access to the tree of life. At that point, they became mortal and were destined to die. Prior to that both were in a condition perhaps best described as, “conditional immortality”. As long as they abode in the favor of God, both had access to the tree of life and would continue to live. To make clear – the idea that Adam was destined to die physically not because of sin but rather because he was human is repugnant to the teaching of Scripture, not to mention the two thousand years of church history where this novel idea is nowhere to be found. A side note here – one thing I have observed about some of these teachers that have infected the Preterist movement is that they are strangely reminiscent of the ancient Athenians. The more novel the teaching that some of these men concoct in their fevered minds, the more they seem to feed upon it themselves and the more their poor victims revere their “great depth of insight” into the things of God. Those misleading the church at Thyatira boasted that they alone had a secret, esoteric understanding of the deep things of God, unknown to most. The truth, according to their risen Lord, was these things were the products of men’s minds and were in actuality, the deep things of Satan! If men will play loose and fast with the Scriptures allegorizing away the plain meanings of words as they have been commonly understood for two millennium, then it is not hard to understand why the Lord will judicially smite them with spiritual blindness for handling His word so deceitfully. Elaborating further upon this punishment for Adam’s sin. Some may of course arrogantly take it upon themselves to redefine the meaning of the word “death” in this passage and strip it of any physical meaning but that does violence to the entirety of Paul’s following arguments where he is arguing about the reason even infants die. “…Nevertheless, death reigned from Adam until Moses, even over those who had not sinned in the likeness of the offense of Adam…” (Romans 5:14). The only ones “who had not sinned in the likeness of the offense of Adam” are infants. Paul is explaining the doctrine of original sin here, a bedrock foundation of the Church; namely that Adam was acting not only as an individual but as a Federal Head. Whatever he did would be imputed to his seed. His disobedience was thus imputed /accounted /credited /charged to all men meaning all human beings are born guilty of the sin of Adam, before they ever do anything wrong themselves. Why else would infants die seeing that the wages of sin is death. What sin could any infant commit that would bring down this punishment upon their head? Answer – there is no actual sin of their own but rather the guilt of Adam’s sin. By the way, this is the reason that our Lord Jesus had to be fathered by the power of Holy Spirit and could not have been born of a man. Had he been born of a man, the sin of Adam would have been charged to him as well since the guilt of the offense of Adam is transmitted by the man as well as the defilement of our nature( the old man, the flesh). The force of Paul’s argument is gutted if these peddlers of falsehood get away with their redefining of the clear meaning of words. Why is death in the world and where did it come from? Answer – from the sin of one man, Adam. He sinned and death entered on account of his sin. Answer – they are guilty of the sin of Adam. Answer – if it is not “fair” as you say, then the method of God employed in the salvation of sinners is not fair either. God, in His wisdom, chose to have one man act on the behalf of many (Federal Headship). What better representative could the human race have had? Adam was fresh from the hand of God, had his own innate righteousness, knew neither good or evil and had no fallen nature from which temptation arises. If you still think this is unfair, consider, would have said Paul, that if Adam could not have represented a group of people, then neither could have Christ Jesus represented a group of people. If you did not have Him representing you, then you would have had no hope whatsoever, because you were without strength/helpless (verse 6) and were his active enemies (verses 10). The focus in on this doctrine a bit more closely – the death Paul is speaking of in these verses is PHYSICAL DEATH, because that only and not spiritual death, is something that any human being can observe with his or her own eyes. Paul is explaining something that is OBVIOUS to all men, namely, that infants die, and he is providing an explanation for why this tragic fact exists. To wrest these passages by twisting the meaning of death here to be only spiritual death, is to make Paul’s arguments seem like those of an imbecile. Tell me, which human beings have the power to look at “those who did not sin in the likeness of the offense of Adam” and know as something evident/obvious to all casual observers of human existence that they are spiritually dead? Answer – no one! The only reason any of us even know this truth about spiritual death is because we have been informed of it by the gospel. It is not something that can be seen by the human eye. In this sense we can say, “Flesh and blood has not revealed this to us but our Father in heaven has”, through His Word! This is the reason we run to Christ to close with Him so that we may have life and that more abundantly. Imagine God attempting to explain the sense of guilt and fear and the sense of shame and defilement that arise on account of sin prior to Adam and Eve sinning. After all, those are the consequences of “spiritual death”. How would that be communicated? One can readily understand the concept of the cessation of physical life being communicated to them by the Lord as the threatened punishment for disobedience. Why even a dog can grasp that! Any casual observer of dogs or any other mammal or bird or sentient life knows that all have an innate instinct for self-preservation. That had to be created in man, as well as in all life, seeing that without it mammals, etc, would be plunging themselves to ruin by exposing themselves to harm and pain, etc. That is something easily understood of all sentient life. However, when we deal with guilt and shame, those are unknown to other animals or birds or whatever. A dog knows when it has done wrong because it has been conditioned by its master that certain actions bring pain or displeasure of the owner but can anyone say that a dog that has done wrong has a sense of shame and defilement? I think not. It does understand cause and effect – this action brings this punishment or infliction of pain and thus a fear arises in the animal, but that is the not same thing as the guilt that the conscience produces. I am waxing philosophical here but I have a reason…. What I am hitting at is that the punishment due to sin, which we all agree does include spiritual death, was, in addition to physical death, an awakened conscience and the necessary connection between that and guilt/fear and the sense of shame and defilement that arose on account of sin. Those must be felt to be understood and were not something that was originally in man fresh from the hand of his Creator any more than they are in the lesser mammals. That instinct to preserve their own life however must have been there otherwise the threat of God would seem like foolishness to Adam when God first warned he and Eve about the forbidden fruit. They would therefore understand the death threat to be a cessation of their own physical life but would have no inkling whatsoever what “spiritual death”, would have meant. That is the reason I prefer to define what is meant by the use of the term “spiritual death”. Some of these men peddling this falsehood toss the term about but one has to wonder if they have the faintest notion of the nature of spiritual death. Yes, it is separation from God but it is more than that. What does it mean? It consists of those things I mentioned above plus some. Specifically, the separation from the GRACIOUS presence of God. Those in hell are technically not separated from God. They are tormented in the presence of the Lamb and of God. That presence that the wicked experience is the PRESENCE OF HIS WRATH AND JUSTICE being meted out to them as punishment for breaking His laws. Also, in that same Presence, is the fully awakened conscience with its never-ending recriminations against the man and the continuous accusations it will bring against him forever. Then there is the sense of nakedness, of being open to the eyes of Him from which no one can hide and the sense of inward defilement and corruption. Isaiah experienced this sense of defilement when he recounts the magnificent vision he experienced in the 6th chapter of the book that bears his name. His reaction after encountering an All-seeing, perfectly Pure and Holy Being? Again, how would God have communicated this sense of inner defilement to Adam in his innocence and original righteousness, whose nature was not in the least bit defiled prior to his sin, if the only death threatened to Adam was spiritual death as these deceivers assert? In one sense all men experience this during conversion/regeneration although to a lesser degree. The awakened sinner senses his or her’s own defilement and utter nakedness before the eyes of a holy God and realizes they have need of being washed, cleansed, purified. He or she also has their eyes opened to see their precarious position, exposed to the wrath of God on account of their sins. This godly repentance is salutary for the child of God because it makes him or her reach out for the precious remedy provided in the Gospel. But, the wicked, who die in an unconverted state, will experience these same things in a much fuller and terrible sense EXCEPT THERE WILL BE NO REMEDY. The words of Newton are good here: “’Twas grace that taught my heart to FEAR, and grace my fears relieved”. What is fear but the reaction of the conscience to the sense of guilt brought about in the sinner through the preaching of the gospel which brings the man face to face with God’s righteousness and stern, inflexible justice? FEAR is now felt and experienced for the first time by the man. Prior to that, Adam walked in sweet fellowship with his Creator. Now, suddenly he is afraid of that same presence with the sense of his own nakedness filling him with shame. Spiritual death then puts a man in a state in which when one realized, consists of the sense of guilt with its consequent fear, and defilement with its consequent sense of shame that all men are liable to as a result of the sin of Adam. It is also having the mind or understanding darkened and made hostile to God, of being made blinded and unable to see the light of the glory of Christ, of being deaf and unable to hear His voice speaking through nature, and in the Word without the aid of the Holy Spirit, of being utterly bankrupted before God as to having any strength, any ability, any hope of saving one’s self from this predicament were it not for grace. How would God have explained this to Adam and Eve who came forth bearing in themselves a perfect righteousness only to have squandered it all away? Personally, I do not think God even attempted to explain this aspect of death which in my mind reinforces the idea that they both understood the threatened death as being physical in nature. We can also see from Scripture that Adam and Eve knew EXACTLY what guilt, fear, shame and defilement were AFTER THEY SINNED. That was PART OF THE PUNISHMENT for sin! very same day in which he sinned, that therefore God could not have been threatening his new creature with physical death but ONLY WITH spiritual death. We have already dismissed this notion for the foolishness that it is, but lest it be said that we did not address the “in the day” part of the text, allow us a bit of liberty to deal with that. Further to this point, let us consider the second son of Adam, Abel by name. We know what happened to him – he was murdered by his wicked brother Cain. Yet we read something about Abel in Hebrews 11. Paul makes it clear in this passage that Abel offered his sacrifice in faith, whereas we know from Scripture that the “faith” in which Cain offered his offering of fruits of the ground, was not the same as the faith of his brother. The question is, how did Abel know to offer a blood sacrifice? From where did he gain this knowledge? “Now faith cometh by hearing and hearing by the word concerning Christ.” (Romans 10: 17). In other words, one MUST HEAR the gospel, the word concerning Christ, in order to obtain saving faith. And where did Abel hear this word concerning Christ and from whom did he hear it? It is obvious that it was from his parents, Adam and Eve. Remember, both of them were present at the first proclamation of the gospel in the form of the protoevangelium. Where did Adam and Even get this knowledge? From God of course as there was no one else that they could have gotten it from since those two were the parents of the entire human race! Thus, Adam and Eve preached the gospel of the Seed of the woman to their son Abel. Since God is the Lawgiver, only He has the right to define the penalty to breaches of His laws or commandments. That penalty is very clearly stated in Scripture in both Testaments and it is death. The justice of God requires the death of the transgressor as satisfaction for His violated laws. The blood represented the life of the one slain. When it was shed, one life was substituted for another. Abel understood this and thus offered an animal as a substitute to take his place and bear the penalty for his sins. Only in that manner could his person be accepted by God, since He, being perfectly Just, cannot pardon a sinner and accept his person unless His justice is also satisfied. But that raises the question, “where did the idea of a substitutionary sacrifice originate?”. Why, in the death of the animals whose skins that God Himself provided to cover the nakedness of both Adam and Eve! There in the Garden, at the very beginning of the fallen condition of the man and his wife, the Lord God introduced the merciful principle of a SUBSTITUTE which would take the place of the one who had sinned and would die in his place. This substitute would die to satisfy the righteous requirement of the Creator’s broken law and in so doing, allow God to show mercy to the one whose place it had taken. What marvelous grace is on display in the earliest story contained in the Bible! What transpired in that Garden, all of it contained within the single verse (Gen 3:21), is that the animals whose skins provided a covering for Adam and Eve were SLAIN TO TAKE THE PLACE OF THEM BOTH! The death sentence which was to fall, “in that day”, was executed on those animals, “in that day”. It was their blood, and not the man and woman’s, which was spilt in order to satisfy the justice of God. That sacrifice allowed Adam and Eve to go on living even though the damage had been done, their natures corrupted and their access to the tree of life cut off. Incidentally, we would be remiss if we did not state the obvious –if the death sentence threatened by God to Adam was not one of a physical death as these deceivers incredulously assert, then why was the blood of those animals shed? Those animals died physically – they did not die spiritually. How could they? Did their consciences suddenly become defiled? Did these animals undergo some sort of defilement to their nature? What kind of foolish thinking is that? No, those animals died physically to teach Adam that the death sentence for his sin was one that was not only spiritual, but physical. Remember what we just read in the book of Leviticus. The life of the flesh is in the blood. The shed blood of those animals represented their shed lives, in place of the lives of both Adam and Eve. A life for a life! To sum up this section – God did indeed slay Adam and Eve “in the day” that they sinned in the Garden, in the animals which were dealt the death blow and sacrificed in their stead. Additionally, there seems to be some sort of notion circulating that God must inflict the punishment for sin the very same day any man or woman sins on the very day they commit sin. I am not sure what that originated to be honest but suffice it to say, if we think back to the subject matter in Romans 5 where the Apostle Paul tells us that death sometimes passes upon infants, what we learn is that regardless of any sins that men may or may not commit, ALL SINNED IN ADAM. God would be within the right of His divine justice to slay us all from birth! As a matter of fact, Job says as much. Keep in mind that while God is a God of Justice, He is also longsuffering and merciful. It is that longsuffering of God which delays the punishment that guilty sinners deserve. Yet make no mistake about it; Vengeance is His and HE WILL REPAY. Are the wages of sin still death? Does a single sin call for the death of the sinner? Yes, it does. Yet we see men defying God daily and mocking Him to His face and yet they live. Is God asleep? Does He not see their wickedness? Indeed He does! Men foolishly believe that the Most High is indifferent to sin but He is not. Every man will face his own day of reckoning and learn, sadly to his own false sense of security and peace, that the wages of sin are indeed death. Paul warns of men STORING UP wrath for themselves in Romans 2. His Lord warns the stubborn and apostate Jews of His day to “go ahead and fill up the measure of the guilt of the sins of their fathers”. There is indeed an end to the forbearance of a Holy and Just God. Thus poor sinner, fly to Christ now, while there is still time, while you may still obtain mercy and forgiveness before your time of the longsuffering of God ends. Remember, LONG-suffering is not INFINITE-suffering but long. It does reach an end. These “New apostles”, who are nothing but false teachers, have set themselves up against the apostles of the Bible upon whose doctrine the church’s foundation was laid, and inform us that death is a consequence of “being human”, not a consequence of sin. I think I will stick with Paul and leave these deceivers to their own devices. What is so disconcerting is the tragic fact that those who would actually assent to this as being remotely true, completely miss the point of the purpose of death as it involves the child of God. So does our Lord long to show us His glory! What a beautiful expression of the love of our Lord Jesus for His precious bride! It is that glory which we are privileged to behold even now but will behold in its fulness when our eyes close in death. May this hope, a living hope, work within us to produce a desire for holiness and warm our hearts with fervent love for our glorious Savior. But think for a moment, How pray tell is the child of God ever to BE WITH JESUS WHERE HE IS, how is he to BEHOLD HIS GLORY, if he never dies physically? Answer that one? Of course he or she must die but now, because of the work of our Mighty Savior, DEATH HAS LOST ITS STING. Instead of being the great object of fear or all men, the great debt owed for the punishment of sin, it has been transformed for the child of God into the very means whereby we take possession of our heavenly inheritance! Alas, we dwell on the earth, separated from our inheritance, our promised land, by the veil of death. But once death comes, we pass from this life, our Egypt, and enter our heavenly Canaan, where our glorious Savior there waits to show us His glory. There and then we will marvel at that splendor which far surpasses anything our mere mortal minds can grasp in this condition. “O death, where is your victory? O death, where is your sting?” (1 Cor 15:55). A side note to really bring home the force of this wonderful truth – I am a beekeeper of over 40 years’ experience. In all that time, I have spent many hours teaching both adults and children about these marvelous and fascinating creatures. One of the things that I do when teaching them is to bring with me some male honeybees or drones. I take these out and ask them if any are willing to hold the drones in their hands. Their initial reaction is always the same – there are no takers. Why is that? Because they are afraid of getting stung! However, and this is the part that deals directly with the above text of Scripture, once I inform them of the fact that male bees, drones, HAVE NO STINGERS and thus CANNOT HARM THEM, they all change their attitude immediately. Now, they clamor to hold the insect and listen to its buzzing sound and feel it tickle their hands! See what a profound difference the knowledge of a simple fact can make once it is understood? The once feared insect now becomes the object of delight and fascination. This is what Paul is telling us. DEATH HAS NO STING! It is now, on account of the glorious work and the might triumph of Christ over sin, over death, over Satan, over the grace, over the world, OVER ALL, HARMLESS to the child of God. We need not fear it any longer because its sting has been removed. To use a theological term, it is NO LONGER PENAL in any form. By that we mean to say is that is it not harmful to the child of God in any manner. Instead it has been transformed into the gateway to eternal glory! Hallelujah! The foolish statement that comes from the mouth of our adversaries in this matter: “ Why do Christians still die physically if the death that Christ died was physical and He died that death in their place?” betrays a complete ignorance of what has happened to the very nature of death in regards to the child of God as a result of the work of Christ on that bloody cross. It is no longer PENAL in any way. Period! How could that which ushers the child of God into the presence of their Lord be considered as penal? How do you think the early Christians could go to their graves singing, in spite of the horrors about to be inflicted upon them? They looked through the eye of faith and saw the entrance being opened for them into their promised inheritance wherein their glorious Lord was waiting to receive them. This is the same truth that our Lord Jesus taught His disciples during the days of His flesh. Dealing with the events surrounding the resurrection of Lazarus from the grave. Jesus is speaking with Martha, one of the two sisters of Lazarus. There are what appears to be contradictions in this statement but once it is understood in the light of what we have been discussing, any apparent contradictions vanish into the ether. The first death that Jesus speaks of is without question physical death. His statement here is what Christians of all generations have drawn strength from during times of distress and intense persecution as well as during peaceful passings. “For to me, to live is Christ, and to die is gain” (Phil 1:21) says the apostle Paul. Why is this? Because as we have stated, death is now the means by which the child of God enters that heavenly inheritance and leaves the sorrows, sadness and trials of this world behind. They “live” forever with Christ even thou they die physically. Let’s flip the order of this verse around, respectfully I might add, to help us better understand it. “He that lives and believes in Me shall never die. He who believes in Me shall live even if he dies”. Here Jesus tells us that those who believe in Him shall never die. Yet He clearly says that those who believe in Him will live even if they die. How can they die and yet never die??? The carnal minded individual scoffs at this and ridicules it. The child of God, who has been taught of God, understands that there are TWO KINDS of DEATH here mentioned. What Jesus is saying is that while those who believe in Him will die physically, they will not die separated from the gracious presence of God and spend eternity in hell. The first death mentioned in the actual verse is physical death. The second death mentioned is eternal death in hell. To die physically is to live forever for those who believe in Jesus! That is the same thing as death having its sting removed. It no longer needs to be feared. The “king of terrors” as the Scriptures refer to death, becomes a pipsqueak with much bark but no bite! What unspeakable comfort is contained in these verses for the man or woman of faith! To sum up – those who would teach that the death that Adam was threatened with in the Garden was only spiritual death understand nothing of which they speak. The consequence of this wretched new doctrine of theirs leads to the inescapable conclusion that the physical death of Christ meant nothing! It was only a “sign”. The precious blood of the Spotless Lamb of God, was shed uselessly other than as some sort of symbol – that is exactly what these disciples of the devil are saying! I read nothing of this PRECIOUS BLOOD being any sort of “sign” as is being claimed by these uninspired dreamers. Instead I see it referred to by the inspired apostle as the REDEMPTION PRICE paid to discharge the debt owed by the people of God. “But when Christ appeared as a high priest of the good things to come, He entered through the greater and more perfect tabernacle, not made with hands, that is to say, not of this creation; and not through the blood of goats and calves, but through His own blood, He entered the holy place once for all, , having obtained eternal redemption. For if the blood of goats and bulls, and the ashes of a heifer sprinkling those who have been defiled, sanctify for the cleansing of the flesh, how much more will the blood of Christ, who through the eternal Spirit offered Himself without blemish to God, cleanse your consciences from dead works to serve the living God?” ( Hebrews 8:11-14). Notice carefully how Paul uses both phrases, “the blood of Christ” in the 8th chapter but here in chapter 10, he employs the expression, “the blood of Jesus”. Christ is the name of the Messiah while Jesus is the name of the MAN, Jesus of Nazareth. Lest some might come away with the misguided idea that the blood of Christ which atones for sin is purely spiritual in nature, Paul uses the name of the man, Jesus, to denote that this blood which atones for sin is also the physical blood of a human being. The blood of a man, a kinsman redeemer, was shed in death, all of it to the point that there was nothing left of it in his broken body upon that cross but water (John 19:34), to pay the debt of His poor relations, who had a debt that they could not pay to the justice of God. It was no mere sign! These deceivers have misled far too many of the Lord’s precious sheep with their novel theories and twisting of the clear meanings of words. If you are one that has been caught in the snare laid by them, make haste and do not delay to reject their teachings and return to the orthodox teaching concerning the death of Adam that has governed the church for two millennia. This entry was posted in Adam. Bookmark the permalink.